Have you ever wondered as an engaged couple who has everything that you need for a home, what unique wedding gifts to get in your registry? Couples today are getting married later in life and have all the household items they need for their home. In fact some of them have been living together for some years and may also have two sets of things. What kind of wedding gifts would appeal to couples who have everything they would need? Here are top 5 unique wedding gifts that couples who have everything can consider. These gifts will be special and meaningful and add value and pizzazz to their lives. 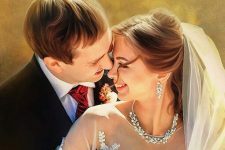 Let an artist capture your best wedding or engagement photograph on canvas. An artist created painting of your favorite photo will be a great way to remind you of all the love you have for each other. A photograph is good but custom portrait is special. When someone is painting a portrait for you, it adds depth that is not easily achieved in a photo. Perhaps that is because the act of painting is generally more meaningful than someone taking a photo on their phone, but with a blank canvas you can truly capture a fresh-faced couple fully in love: maybe a rosy cheeked glow, or eyes that sparkle. It is certainly a unique way to let the world know that this is the person with whom you’ve fallen in love! Such a unique wedding gift idea! Check out Artist Amro Ashry’s stunning portraits HERE. Get an original artwork create by an artist. This is a gift that your guests will feel good to give since it has a special meaning and is a one-of-a-kind piece that will last all your life. You will be supporting an artist instead of a big retailer and at the same time get a gift that will be valuable, perhaps become an heirloom piece to be passed on to your kids. Who knows it may even increase in value as the artist gains more recognition. 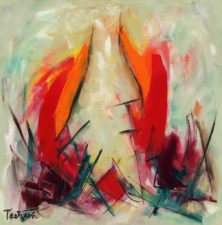 Check out Artist Lynne Taetzsch’s striking painting HERE. 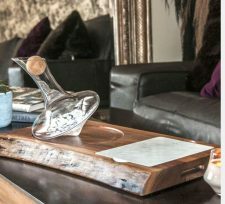 If you want to add some oomph to your living room table, get this revolving wine decanter and glasses on walnut wood by Swoon Living. This is an artist made custom blown glass and wood. Swoon Revolving Wine Glasses are hand blown in Chicago. The glasses are sure to make your wine-loving friends jealous. Pour yourself a little wine and sip and spin your evening away. As you play, your wine becomes greater with every turn as more oxygen is brought into the wine. The concept is all about form and function without forgetting to have fun. This item is available via Swoon Living. 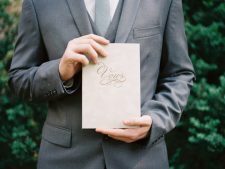 Vow books are another unique wedding trend that couples are adopting. You will utter the most important words of commitment of your life on your wedding day. The Wedding story writer vow books are one-of-a-kind and will forever keep those precious words alive. You can choose your wedding style, colors and décor and your book will be handmade to match your wedding. Order your beautiful and personalized vow book at The Wedding Story Writer. Your wedding is a momentous occasion in your life and your wedding gift should be as unique as your marriage. For couples who have been living together and have everything, their wedding and their gifts or gift registry should showcase their personality and brand and the only way to do this is to choose something that is unique and creative and which will make their guests feel proud and good to attend and to be a part of that special moment in their lives. Looking for a unique registry idea? Check out Mishkalo. Mishkalo carries a vast collection of amazing artwork from around the world for you to choose from. Please visit Mishkalo.com for more ideas for a wedding gift registry.